Hi,I’m Sonoka from FabCafe tokyo. At the moment I’m at FabCafe, in the city of Toulouse in France. A FabCafe has just opened in Kyoto in Japan, hasn’t it? It’s the third FabCafe in the country after the ones in Tokyo and Hida. I really want to go soon! 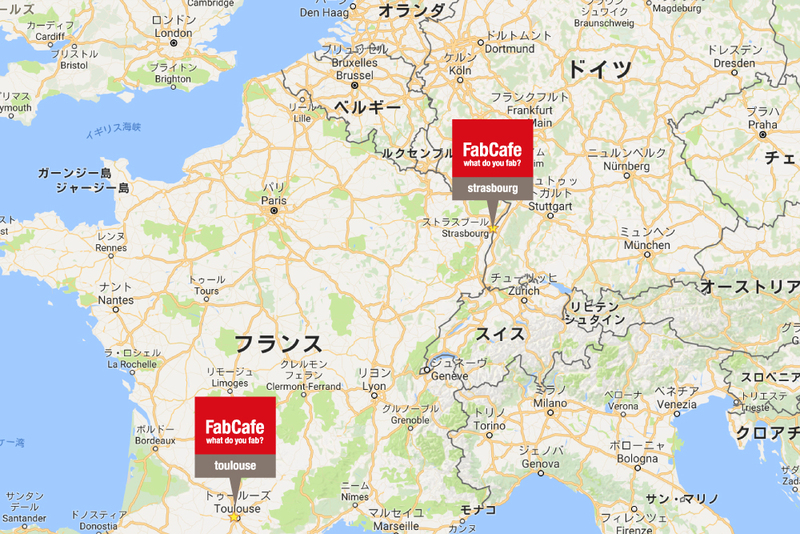 Since FabCafe tokyo opened in 2013, locations in Taipei,Barcelona,Bangkok,Toulouse,Hida,Singapore,Strasbourg and Kyoto have won the brand fans around the world, and there are currently 9 branches. I had already been to the FabCafes in Taipei,Barcelona,Bangkok,Hida but this was my first time setting foot into one in France! While I’m staying in Toulouse for 2 months and supporting the various FabCafes in Europe, I’d like to introduce some of the unique charms of each location. 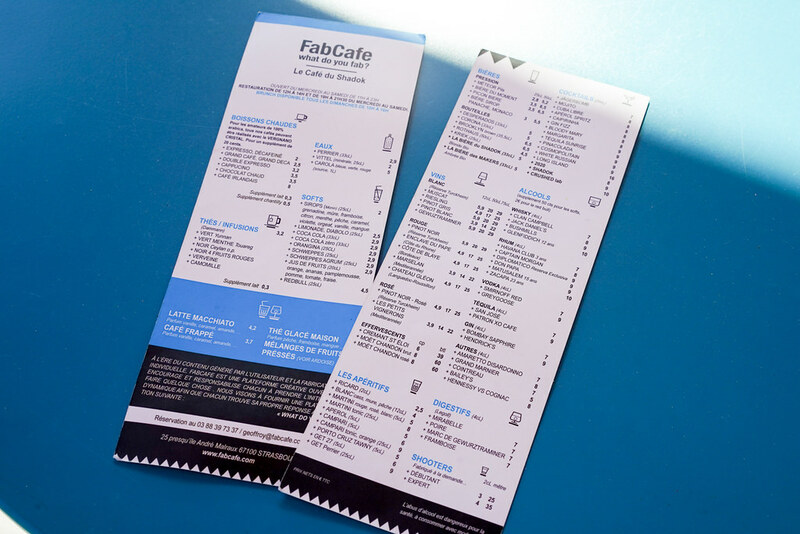 I hope that this report helps you appreciate and enjoy the world’s FabCafes, whether you’re someone who, like me, has visited several FabCafe branches, or whether you’re simply someone who is wondering about FabCafe and its various locations around the world! There are currently 2 FabCafes locations in France. One of them is in Toulouse where I’ve been staying since June. Located in the southwest of France, you can reach Barcelona by plane within about 1hour. The other is FabCafe Strasbourg, which just opened in December 2016. ▲From Strasbourg(on the right side of the map) to Toulouse(on the left) takes about an hour and a half by plane. 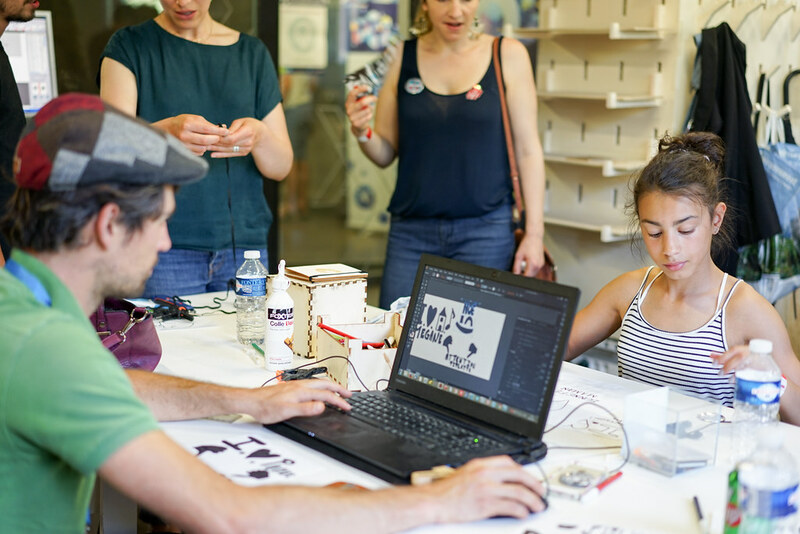 Before heading to Toulouse, I visited the Mini Maker Fair in Strasbourg on the 27th and 28th of May, so I’ll start with my impressions of that. Strasbourg, a city of warm weather and warm people! Strasbourg is located in the northeast of France, near the border with Germany, and takes around two hours to reach from Paris by train.The river Ill runs through the old part of the town, and the scenery is so beautiful that it’s a pleasure simply to walk through the streets.Summers are hot (despite the fact that it was May, we hit highs of 37 degrees during my time there! ), and winters are cold, clear, and dry. I’ve only caught a cold three times in my life, and each time it’s only lasted for a few hours over a single day, but on the morning of my third day in Strasbourg the air was so dry that my throat hurt. I would recommend that people coming to Strasbourg carefully prepare themselves for the region’s dry air. Now let’s take a look at the region’s FabCafe. 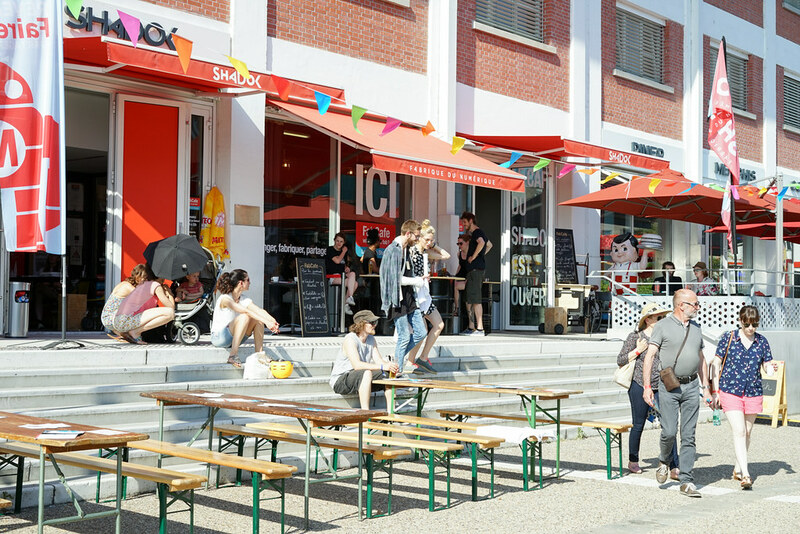 Strasbourg’s FabCafe can be found around 15 minutes’ walk from the center of the city. It’s located within a facility called SHADOK, which supports entrepreneurs and a wide range of creative projects. Enjoying a leisurely walk along the river, I came across an area alive with a distinctive hustle and bustle, and I knew I had found the FabCafe! ▲The section along the river with the red tent (on the left) is the entrance to Strasbourg’s FabCafe. ▲Coming across the the FabCafe sign in a foreign land is a pleasure that’s hard to describe! The 1st floor is an open cafe area that allows anyone to easily pop in. On the two days I visited, the Mini Maker Fair was also in progress. Many families and student groups had come to visit, and everyone was chatting cheerfully. There are offices and universities nearby, so apparently it’s usually busy with students and those who work nearby. The original sign is also cute and carefully designed. ▲Coffee frappés made one by one in a shaker. ▲MenuThere’s a rich selection of original drinks too. I was surprised to see FabCafe original beers on the menu too! There were two varieties, SHADOK beer, which was a dark beer, and MAKERS beer, which was a white one. 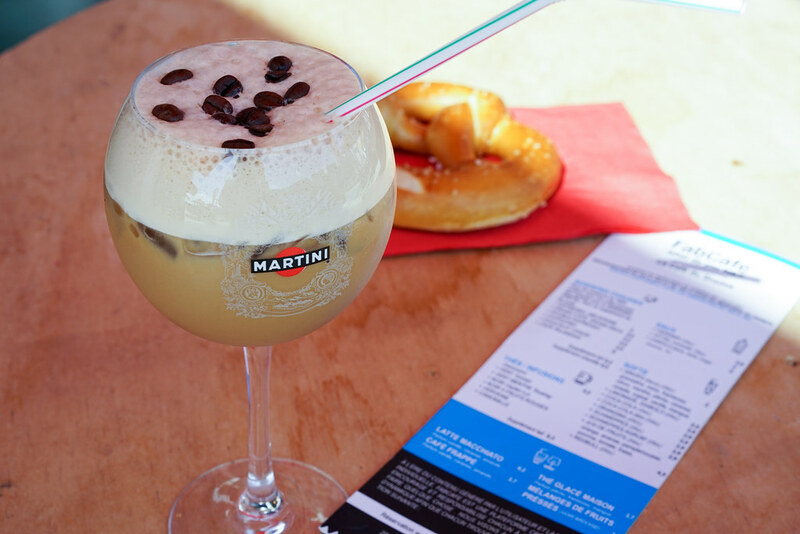 Both were refreshing and perfectly suited to the heat of Strasbourg’s summer. It seems the beers are produced in collaboration with one of the many beer companies in the Alsace region. I wish the Tokyo branches had their own beer too! Fully fledged FAB utilities, and an open environment that anyone can jump into. 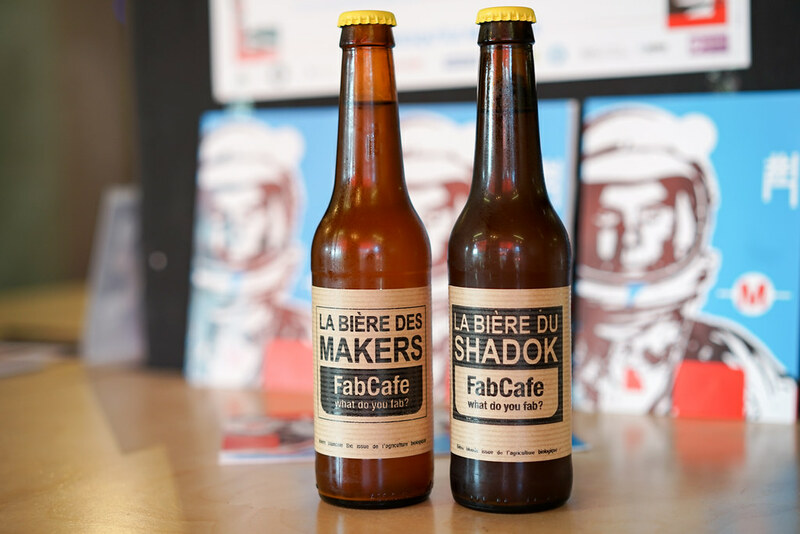 As well as its FabCafe, SHADOK houses several co-working spaces and the offices of a number of enterprises, with cafes and event spaces on the first floor, and the FAB space’s AV.LAB and offices if you go up to the second. Classes and workshops are run in this location every day. 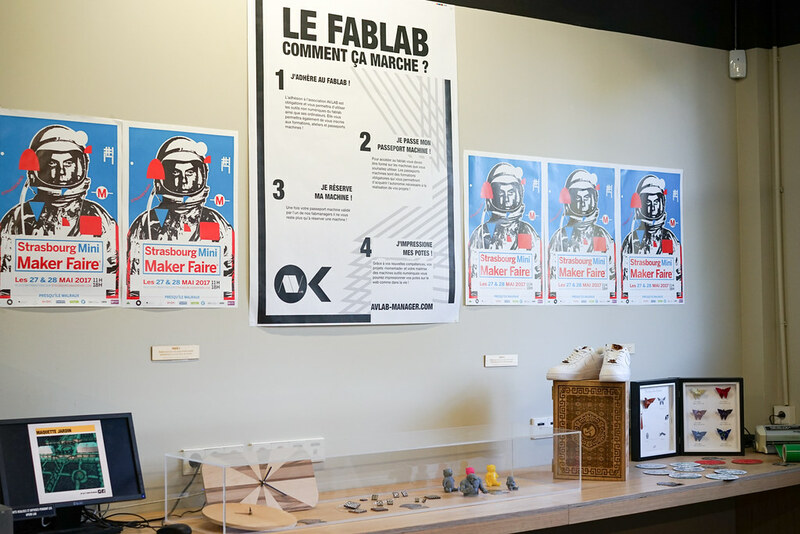 At a glance, it gives the impression of a fun clubhouse, but it’s kitted out with some impressive gear, including CNC,laser cutter, 3D printer, and vacuum forming equipment. You can make anything there, from small utensils to furniture. Tours are held every week, and anyone is allowed to operate the machines freely on an hourly basis once they’ve completed a course. Conveniently, you’re also able to use the machinery at other locations across Europe once you have this certification. It’s really nice to have the facilities to bring your ideas to life no matter where you are! A diverse range of people were using the area, from a painter making a badge from a design they had just there and then drawn, to designers exchanging ideas and children participating in workshops. ▲Drawing a poster for Mini Maker Fair with CNC! ▲Here’s the finished poster! Very cool. ▲The very energetic Diane, who handles maintenance of the AV.LAB’s machines, and organizes workshops! ▲A workshop aimed at children was being run that day. The kids were making original cases based on illustrations they had drawn on paper. The Mini Maker Fair is a fun place for families. I’d like to talk a little about the atmosphere at Mini Maker Fair Strasbourg. The fair was full of all kinds of stalls, ranging from the latest technology like drones and projection mapping to silk screen printing, knitting, and other crafts. There were various ways to enjoyably pass the time at the fair, from participating in workshops to attending talks. The sight of so many families enjoying the event together left a strong impression on me. The thing I look forward to most when I visit FabCafes across the world is meeting local friends of FabCafe. 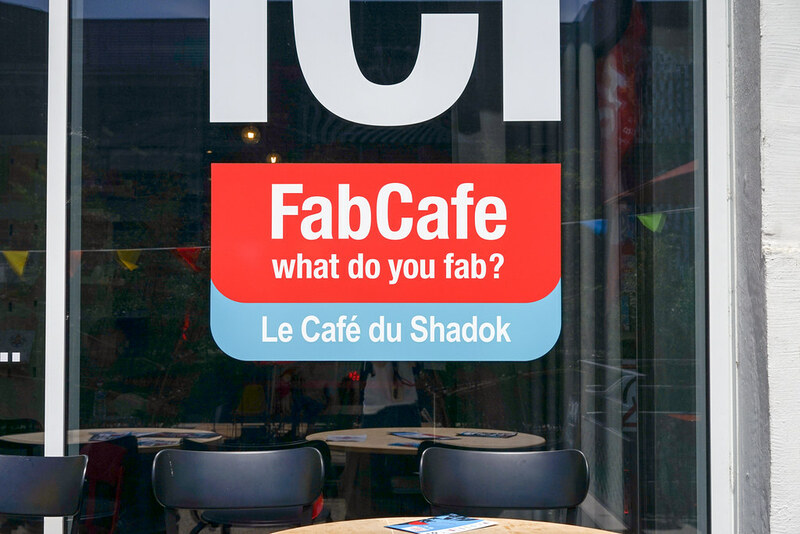 Each time, I find myself excited at the prospect of who I might find running the FabCafe.Strasbourg’s team were all very cheerful, and the environment was extremely welcoming. If you go to Strasbourg, be sure to Say hi! Wearing a Muhammad Ali t-shirt that he had just made (!) at the silk screen printing studio that had been set up at Maker Fair. Jérémie like Japan so much and often go on a trip. He had first discovered FabCafe on one of his travels. Immediately feeling in tune with FabCafe’s open environment, it seems that he told Rodrigo about it right away! He’s now the representative of FabCafe Strasbourg, and one of the founders of the AV.LAB. Rodrigo said he was shy and that I should let him wear sunglasses. Then he struck this pose! Rodrigo works at an organization called Ateliers BAH, and is a designer of products and furniture. After working in fashion in Paris for ten years, he relocated to SHADOK together with Ateliers BAH, and started working at FabCafe. The furniture in SHADOK was made by him too, and it was all really cool! Grégoire is in charge of FabCafe’s cafe section. He joined FabCafe after working in bars and catering for ten years! Every drink Grégoire made was really delicious, and I especially liked the original drink he made by shaking ice tea with syrup. Apparently the recipe is a secret. Hearing his words, I couldn’t help but feel happy too. He seemed to feel that since FabCafe opened, the location had become a gateway to the people of the city.